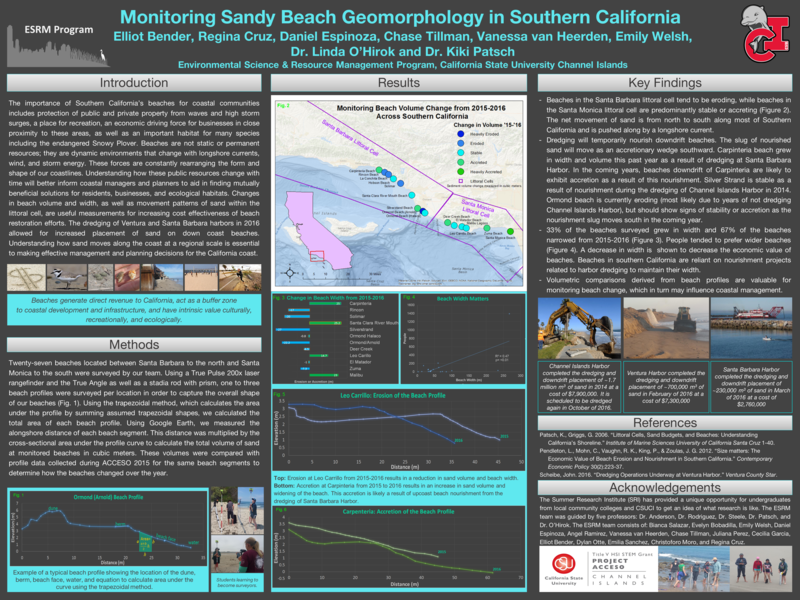 Here is a video made by CSUCI student Chase Tillman on Sea Level Rise and Beaches. I studied the stream channel efficiency of Long Grade Creek, a tributary to Calleguas creek which is partially located on the CSUCI campus. As part of my study, I compared the differences in channel shape and functionality among altered sections of the creek: widened and restored; concrete and rip rap lined; and a section located directly below a debris basin. I then calculated the ideal stream channel form based on watershed characteristics. The altered, concrete-lined sections of the creek were found to be the watershed's ideal stream channel conditions. In addition, following the Springs Fire in 2013, the erosion potential of the slopes increased surrounding Long Grade Creek. A large storm presented evidence of a debris flow in the channel. After performing various in field studies and calculations, I determined there was in fact a debris flow that occured during the storm event that left large amounts of debris, rip rap, and sediment in the channel. After capstone and graduation from CSUCI, I transitioned from my position as the Stormwater Intern for the City of Camarillo to a Stormwater Consultant to municipalities when I was offered a job with Willdan Engineering. Capstone was a learning experience that had a positive impact on how I approach my professional life post-graduation. Independent research is not for the faint of heart. It taught me essential time management, organizational, and problem-solving skills. In addition, it taught me how to my communicate ideas and findings in an insightful and coherent way. Additionally, through my research I learned the basics of stream geomorphology, which I have been able to apply to stormwater retrofit projects and the evaluation of land development on stream hydrology and water quality. Becoming a stormwater consultant would usually require a significant learning curve for anyone new to the field. My experience with my research and previous internship gave me the confidence and knowledge necessary to be successful in my field.